Why would an established affordable housing lending institution decide to change its name? Hamilton says CLF looks at food sources in the community and questions whether a business provides access to healthy foods. Businesses that do provide that access, according to Hamilton, are typically farmers’ markets, grocery stores, and food coops. The USDA defines a food desert as “urban neighborhoods and rural towns without ready access to fresh, healthy, and affordable food,” according to its website. CLF uses this definition as its guideline and encourages healthy foods projects because the people behind the institution believe that for a community to be economically healthy, its people need to be in good physical health, says Hamilton. To determine whether a business will meet the definition of a “healthy food source,” the borrower must do more than just paperwork, according to Hamilton. The loan committee is comprised of lawyers and representatives of various financial institutions as well as a representative of the local Small Business Development Center, which operates under the authority of the Small Business Administration, according to Hamilton. 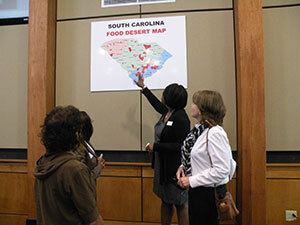 Though the primary function of CLF is as a lender, the organization also supports healthy foods initiatives in its South Carolina communities through advocacy work, says Hamilton. CLF receives funding from government grants, foundation grants, the Community Development Financial Institutions Fund, and banks and corporations, according to Hamilton. There are challenges to realizing CLF’s goal of healthy food access in all of South Carolina’s low to moderate income communities, says Hamilton.